All The Pretty Dresses: So, you know that thin summer blanket Grandma crocheted? So, you know that thin summer blanket Grandma crocheted? 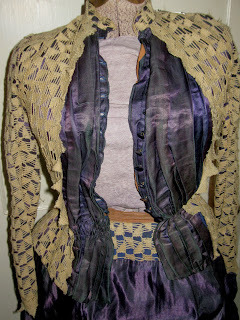 For your consideration today, we have an unusual Victorian two piece bustle dress. 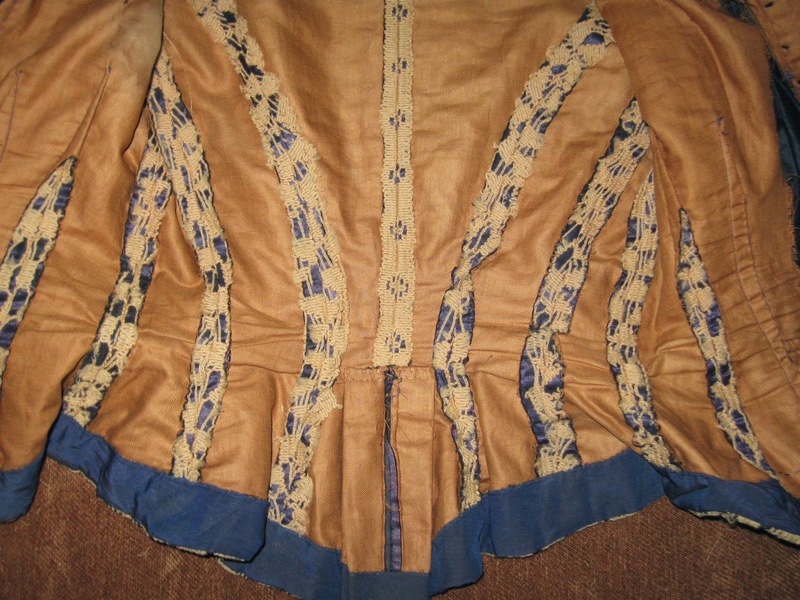 The dress has two layers, a blue layer with a cream or beige overlayer. 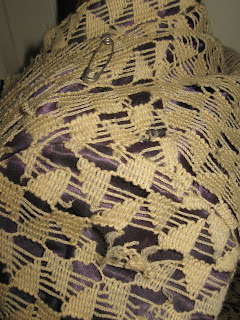 I am not sure what to call the layer on the top, it is not really crochet, and it is not lace. It reminds me of a tablecloth. 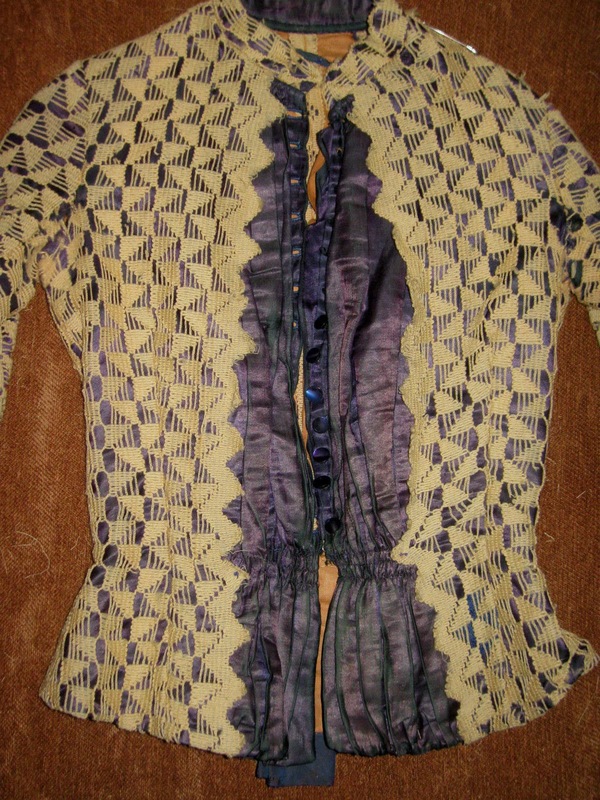 The top has a button front, long sleeves and is fully lined. The center exposes the blue, and I believe this area is silk. 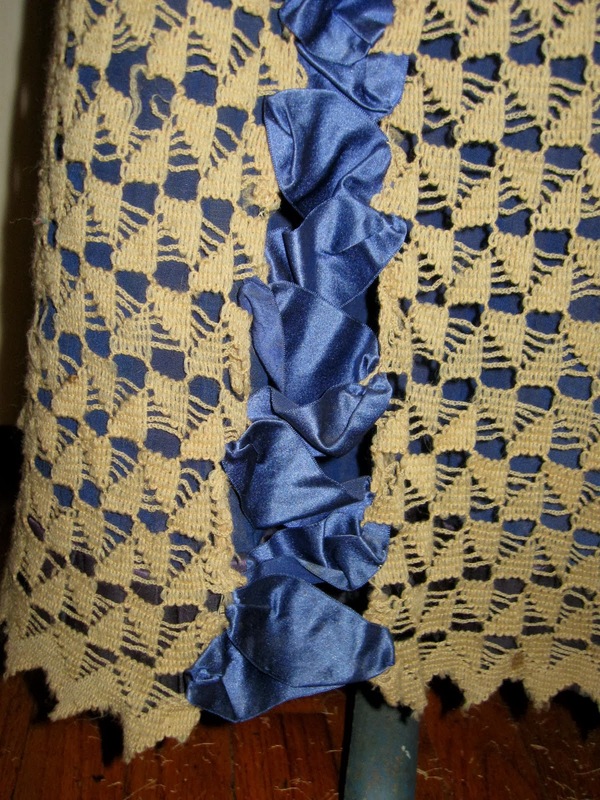 The skirt has a hook and eye closure on the side, with two puffed sections in the back, and a blue ruched section in the front. I think this could be silk also. There is a blue pleated hem like the rest of the blue on the set. 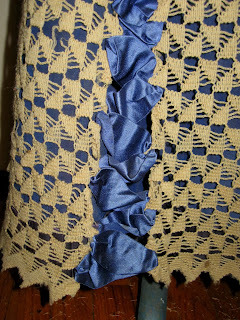 The skirt is fully lined and has a section on one side that has blue ribbon running through. This makes for a great display item, but has some age and condition issues. There is the usual soiling and spotting. 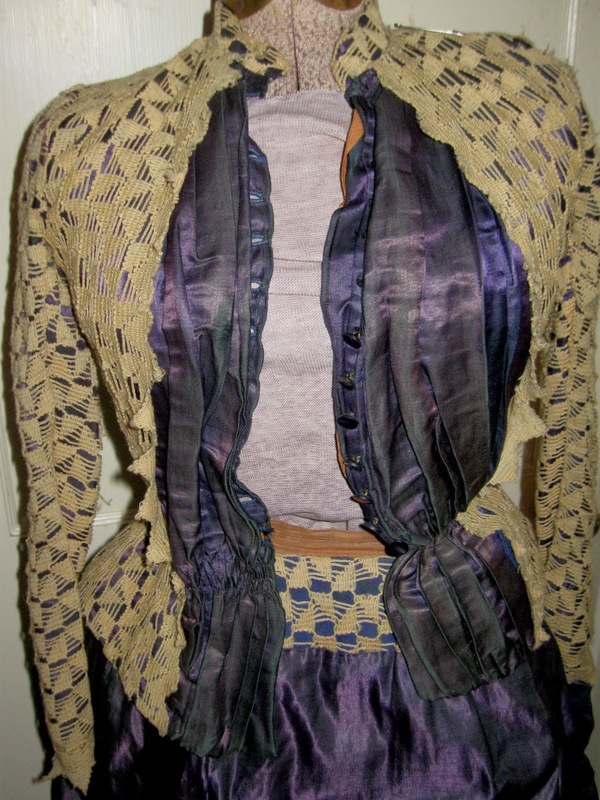 There are several breaks in the overlay fabric here and there, under the arms on both sides, including the blue fabric, some places on the shoulder and the left shoulder has a safety pin on the top that I am afraid to move. 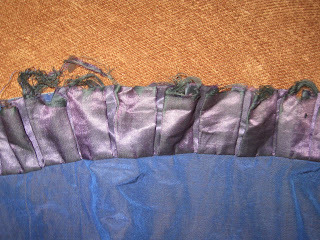 The blue silk in the front has faded. 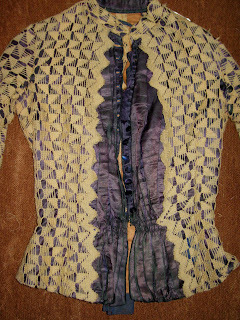 Two button holes are torn, and half of the buttons are missing. 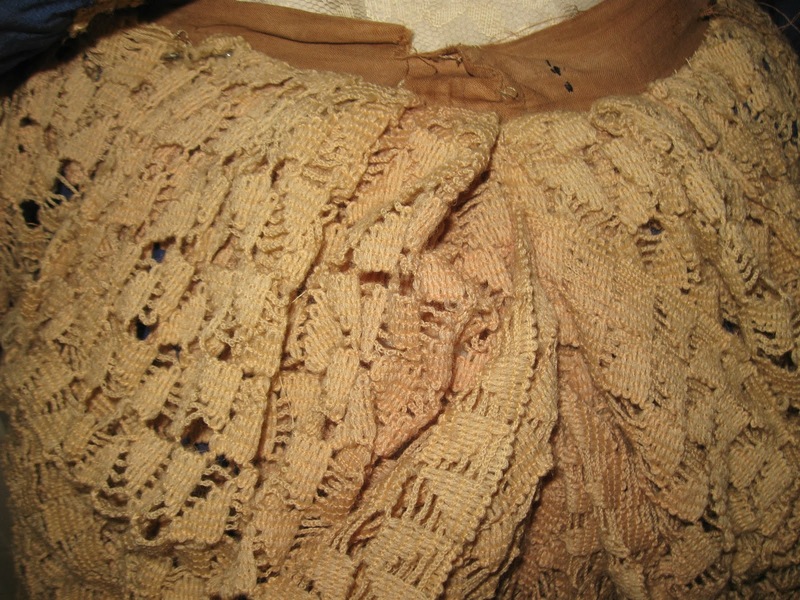 The skirt waistband has some tears, the blue silk ruched section in the front has some scattered small holes, and the pleated hem is worn along the edge. 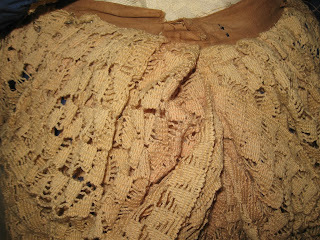 There are a few breaks in the over fabric on the skirt too. Even with the flaws, this is still a great item for display or study. ... The title I gave this one says it all. I'd take it home for the blue parts, but that 'lace' is just ... strange! 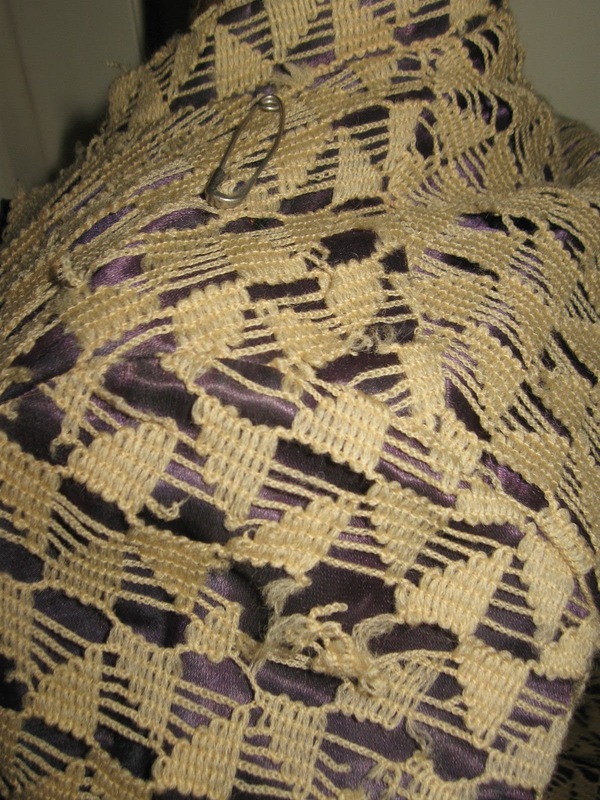 A lot of laces were still made at home. 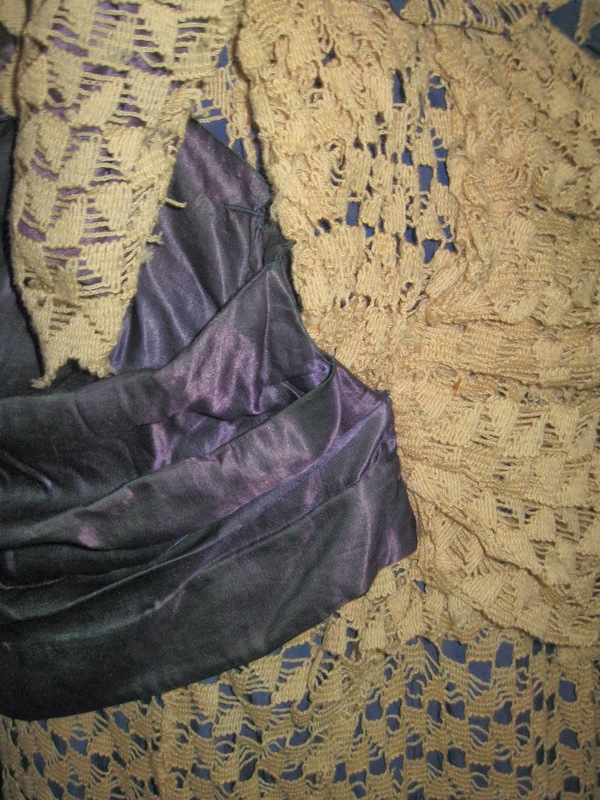 I found a similar lace - for an edging- in a 1886/1887 Godey's book. I think, if you actually cleaned the lace to make it a brilliant white again - the white against the blue would look neat. But yeah - Grandma's tablecloth.